Cheri Moyers lives downtown. For her, it can be a scary, dangerous place. Moyers, a professional singer, real estate agent and former publisher of the New Bern franchise of The Coffee News, is also a force to be reckoned with. Her failing eyesight has left her legally blind, and getting around downtown, especially crossing downtown’s busy streets, is a dangerous thing. 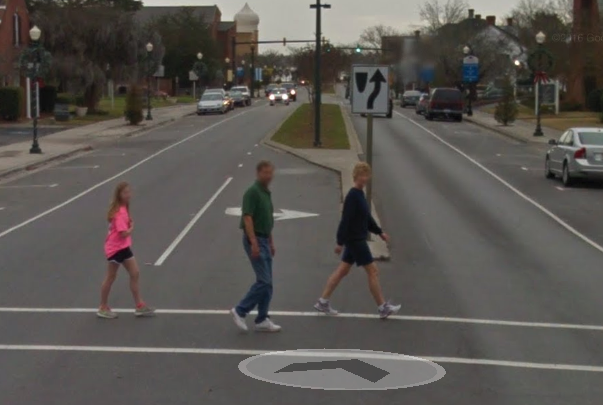 A Google Street View image of pedestrians crossing Broad Street at Middle Street in New Bern. She, along with other sight-impaired people (and perhaps every other pedestrian in downtown New Bern) have noticed a lack of pedestrian signals. Moyers is leading a project to encourage the city to install pedestrian signals at about 10 downtown intersections, at a cost of $1,200-$1,300 per crosswalk (with each intersection having three to four crosswalks … $37,500 to $50,000 in all). Downtown New Bern provides painted crosswalks at its intersections, but not crosswalk signals. The signals Moyer would like to have installed provide visual information for pedestrians, with added tactile and auditory information for people with vision problems. For example, specific placement of the control buttons point the direction a blind person must walk to stay within the crosswalk. A gentle beeping sound, which increases in decibels when surrounding noise increases, provides blind people help finding the traffic signal button. An arrow embossed into the button vibrates when it is time to walk for people with both eyesight and hearing impairment. And an audible device provides blind people information about the intersection and how much time remains before the light turns red. Such a system would be useful to all pedestrians , said a David Ayres of Polara, a company that provides accessible pedestrian signals. He said accessible signals may become a requirement in the future as cities replace aging or broken pedestrian signals or adjust traffic signal timing. New Bern aldermen listened to Cheri Moyers’ presentation but took no action. Moyers brought a friend to the meeting, a mother who is also suffering from declining vision who, like Moyers, lives just blocks from City Hall. “It’s definitely a scary thing waiting at a crosswalk for a safe crossing,” she said.